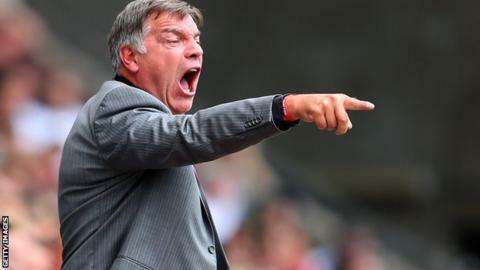 West Ham United co-chairman David Gold has given his backing to manager Sam Allardyce. Gold retweeted posts on Twitter from two West Ham fans calling for Paolo Di Canio to replace Allardyce after the Italian's exit from Swindon, then two more supporting the current manager. "Always interesting to see the different opinions from people on Twitter," Gold himself then posted. "My view is clear though - Big Sam is our man! dg." Allardyce's current deal expires at the end of the season, but Gold insists the club will not enter talks about extending the contract of the former Blackburn Rovers and Bolton Wanderers manager until the Hammers have secured Premier League safety. "We will sit down and discuss Sam's contract situation once our Premier League status has been confirmed and not before," he said in a statement. "This is purely because the three of us [Allardyce, Gold and co-chairman David Sullivan] don't want anything to distract attention from our aim of finishing as high up the league table as possible." West Ham are 11th in the Premier League with 30 points, but have won only one of their last six league games.